FILTRATION LIFE----------------------------6 months/1500G •Depends on water quality and level of contaminants. *For detailed setup guideline, please refer to the installation instruction in the box. Please feel free to contact us,we will response within 24hrs or less. [NSF CERTIFIED]Icepure Brand Filters was Tested and Certified by NSF International against NSF/ANSI Standard 42 for material and structural integrity requirements. 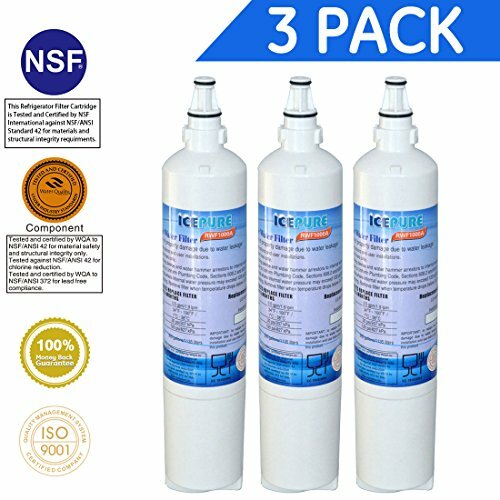 [HIGHEST FILTRATION LIFE]Double Capacity .Lasts for up to 1500 gallons or 6 months.Natural Coconut shell Activated carbon ensure contaminant reduction.Remove sediment,rust,particles,Chlorine,color,Odor,Voc,THM'S. If you have any questions about this product by ICEPURE, contact us by completing and submitting the form below. If you are looking for a specif part number, please include it with your message.